There's one level that every WAD author must have made at some time. No, I don't mean a first level. I'm talking about a test WAD - this is at the point where the author decides to stop filling giant cuboid rooms with troopers and decides to learn how to make real levels, and needs to practice making some real structures (OK, so that might be your first level, but I bet for most of us it wasn't :-). I don't know if the name "BrikBlat!" is meant to mean it was cobbled together like this (makes me think of brik-a-brak, but maybe that's just me) - the author says it started out life as a small test WAD - but it doesn't show it. If only my test WADs had been half this decent :-). 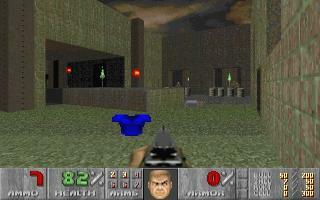 It's a single level, in a in a very Doom 2-ish wood and brick style that I can't quite place - I guess Tenements (Doom 2 MAP17) is the closest in Doom 2, but I can't quite think of the level it's really reminding me of, probably something else in that strongly Doom 2 style, soemthing in Plutonia maybe. Perhaps the reason the style seems unusual is the textures used - the excellent coarse wood and slimy bricks from Doom 2 are usually relegated to dark mine or acid tunnels, so it makes a change to see them in the light. The level starts out with some outdoor brick and metal yards; The architecture is fairly blocky and straightforward, but with some good features so it's rarely dull. It's the gameplay that shines in this level though. The start is quite lively if not too dangerous, with lots of sargeants and imps wandering around and overlooking the first few yards. In fact much of the level is made up of tricky fights like this, with clusters of monsters firing at the player, but cover available that the player can use to gain the advantage. There are a number of traps, although these were a bit tame and lacked the power or surprise to really upset the player. The level progression is a real gem though, not at all straightforward but there are strongs hints that mean the player isn't likely to get lost. There are a good number of secrets as well. As a slight aside (i.e. rant), the level also uses a few long 45 degree staircases - these are fashionable with some level authors because it's puts the way ahead at the extreme top or bottom of the player's screen, so you have to go full size and stand at an angle to the stairs to glimpse what's ahead. Please people, if you want the falling-into-the-unknown feel just do a ladder or a vertical shaft, conversely if you want us to actually be able to fight our way down then don't make the stairs too steep - anything in between is annoying. Overall then, a nice little level with plenty of good action. brikblat.zip, size 258kb, date 1998/01/08. BB16.BAT, size 0kb, date 1998/01/08. BB19.BAT, size 0kb, date 1998/01/08. BBMAP116.LMP, size 113kb, date 1997/11/22. BBMAP119.LMP, size 113kb, date 1997/11/24. BRIKBLAT.BAT, size 0kb, date 1998/01/08. BRIKBLAT.WAD, size 725kb, date 1997/11/24. Brikblat.txt, size 5kb, date 2001/12/30.